After 10 plus years of using a solar reel, we have replaced it with the Aquaflex Premier Monaco Pool reel. 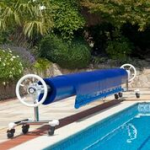 Both my children and their grandparents find it super quick and easy, to remove the pool cover with the Monaco reel. Premier with SmartGear: a unique 3 to 1 reduction gearbox which really does make light work of winding a cover off a pool. The Monaco comes with adjustable feet to take the worry out of dealing with uneven paving. (Castors are available as an additional option). Steering wheels are available in Black or White and because the yoke has coaster bearings it makes winding on covers even easier. So next time you are ordering your roller THINK British and order the best, choose The Monaco and rest assured you will be receiving a reliable reel that looks and works like a dream.